Sriram Krishnamoorthy, a research scientist with PNNL’s High Performance Computing group (Computational Sciences & Mathematics Division), is making a notable impact at this year’s International Conference for High Performance Computing, Networking, Storage and Analysis, or SC14, as co-author of three accepted papers—two, of which, are up for Best Paper awards. This year, the SC14 conference accepted only 84 out of 392 paper submissions, which includes eight Best Paper and six Best Student Paper finalists. 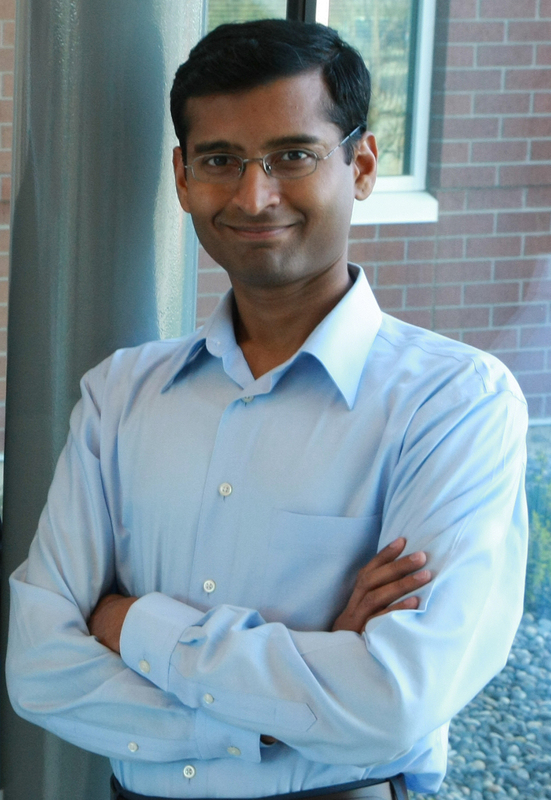 Dr. Sriram Krishnamoorthy has three accepted papers at SC14. The paper, “Communication-optimal Framework for Contracting Distributed Tensors,” co-authored by Krishnamoorthy with a team from Ohio State University, is a finalist for SC14’s Best Paper award. The paper addresses the role of tensor contractions in computational physics and chemistry and efforts to optimize the communication costs incurred in executing them on supercomputers. Meanwhile, “Fault-tolerant Dynamic Task Graph Scheduling” is a finalist for Best Student Paper. The paper, “Optimizing Data Locality for Fork/Join Programs Using Constrained Work Stealing,” also was accepted for the SC14 conference. At PNNL, Krishnamoorthy’s research focuses on parallel programming models, fault tolerance, and compile-time/runtime optimizations for HPC. In 2013, he received a U.S. Department of Energy Early Career award, granting him $2.5 million over five years to explore exascale computing advancements. That year, he also earned PNNL’s Ronald L. Brodzinski Award for Early Career Exceptional Achievement. Already, he has more than 70 peer-reviewed conference and journal publications, garnering Best Paper awards for two publications (in International Conference on High Performance Computing (HiPC'03) and International Parallel and Distributed Processing Symposium (IPDPS'04), respectively). Krishnamoorthy also is an Institute of Electrical and Electronics Engineers Senior Member. This year, the SC14 theme is “HPC matters,” and the conference will focus on how innovative high-performance computing is essential for tackling the world’s biggest challenges. SC14 is being held on November 16-21, 2014 in New Orleans. Rajbhandari S, A Nikam, P-W Lai, K Stock, S Krishnamoorthy, and P Sadayappan. 2014. “A communication-optimal framework for contracting distributed tensors.” In Proceedings of the International Conference for High Performance Computing, Networking, Storage and Analysis (SC’14), pp. 375-386. November 16-21, 2014, New Orleans, Louisiana. IEEE Press, Piscataway, New Jersey. DOI: 10.1109/SC.2014.36 (Best Paper Finalist). Kurt MC, S Krishnamoorthy, K Agrawal, and G Agrawal. 2014. “Fault-Tolerant Dynamic Task Graph Scheduling.” In Proceedings of the International Conference for High Performance Computing, Networking, Storage and Analysis (SC’14), pp. 719-730. November 16-21, 2014, New Orleans, Louisiana. IEEE Press, Piscataway, New Jersey. DOI: 10.1109/SC.2014.64 (Best Student Paper Finalist). Lifflander J, S Krishnamoorthy, and LV Kale. 2014. “Optimizing Data Locality for Fork/Join Programs Using Constrained Work Stealing.” In Proceedings of the International Conference for High Performance Computing, Networking, Storage and Analysis (SC’14), pp. 857-868. November 16-21, 2014, New Orleans, Louisiana. IEEE Press, Piscataway, New Jersey. DOI: 10.1109/SC.2014.75.